Just like other living beings, mammalian cells mechanically interact with their local environment. Cells exert force and sense mechanical feedback to direct a variety of cellular functions. This mechano-sensing process plays an important role in embryo development and tumor genesis and therefore attracts significant interest. 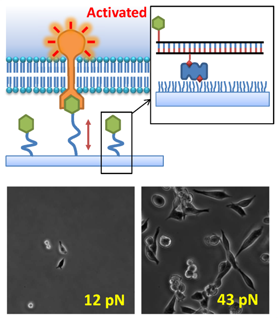 Although researchers observed bulk cellular traction forces during cell adhesion more than three decades ago, the molecular force on integrins (membrane proteins mediating cell adhesion) has not been measured. To measure this molecular tension, Prof. Taekjip Ha and Dr. Xuefeng Wang (CPLC postdoc) developed tension gauge tether (TGT) which is a molecular link breakable at a defined tension tolerance (tunable from 10 pN to 60 pN). Using a series of TGTs with different tension tolerance, they found 33~43 pN tension on integrins during cell adhesion. Moreover, TGT also works as a tension modulator which introduces a mechanical perturbation to cells at the molecular level. This technique is believed to have the potential to add a new dimension to the field of mechano-biology.